Bus Simulator City Driving. Test out your bus driving skills in the big city. Pick up different passengers at different locations, be careful not to run them over. Check your fuel level to make sure you have enough to get around the city and complete the level. Will you maintain a level of professionalism and first rate service to your customers? This game is one of the 3D driving games on Round Games. Enjoy and have fun in playing Bus Simulator City Driving game. Good luck. 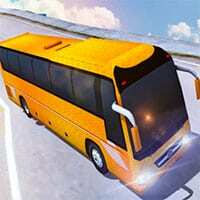 Make sure to check out Bus Parking 3D World 2 Game. You may enjoy playing it.